"Enough bickering. Algrak you are right in that you haven't given any further reason to doubt your word, but that doesn't mean we will suffer your constant criticisms and negativity. If you want to survive through this you will need us to stand with you, not against you, and your continuing comments are only serving to divide the group further, reducing not only our chances of survival, but your chances of escape as well. So, if you please, keep your thoughts and comments in your own mind. That goes for the rest of you as well. I said that you had 10 minutes to come to terms with this. Your time is up. So cease this prattle or stay behind. No one will benefit from insult or condescension and it may very well get more of our friends killed." he motions towards the open doorway. "Algrak, if you would accompany me in the lead. Kenji and Conall have the rear guard. Althena and Sir�ne behind us. Maggot, you will take the middle since you bear Rayne's remains, alongside Cynil. Cynil, please use your healing as you can but shapeshift if you need to to help protect the casters or Rayne." "Haila, follow behind Maggot. If anyone sees a threat warn the others. It is impossible to tell what sort of fate this next chamber has in store for us." With that he walks through the door, looking back for an isntant to see if the others, particularly Algrak, are following before focusing his attention on the area ahead. Posted on 2010-06-22 at 02:23:47. Kenji fell into his position at rear guard next to Conall.. liking his place as those he didnt trust were all before him.. only those of the original party were ones he felt comfortable with in trusting.. the others had only arrived and now were controlling everything.. things moved too fast for his liking. The Samurai kept an eye on the rear so that nothing could sneak up on them.. but he also kept and eye ahead for any trouble from within the group. Posted on 2010-06-22 at 11:21:33. "Off we go then." Algrek took his place next to Alasdair in the lead of the group and moved to open the far door. Posted on 2010-06-22 at 16:59:48. As the group fell in line and all began to move, �Well Rayne, it seems you and I are to walk with the Lady Cynil. Now lets see if I have a tune.� Maggot thinks for a moment, �Yes. I will hum this one as I suspect very few among us would or could speak the tongue of old it was written in, but perhaps it will past the time to the next door.� With that Maggot began to hum very quietly. Posted on 2010-06-23 at 23:09:51. Conall sat and observed this flurry of discussion, the exchange of Rayne's corpse, the insults tossed left and right, and decided Cor had trained him for this... Even if he was unsure of how it would come about. Conall stepped forward. "Look, everyone, we know this is a situation we didn't forsee. Cor, as we know it, is gone. Instead, we have Algrek here, who is almost the same. But, and as much as I miss Cor as we knew him, we can't dwell on the fact that he is gone. We have to make due with what we have, which is Algrek. He is one of our group now, and he shall remain as such. We didn't threaten to kill Cor, so we shouldn't threaten Algrek." Turning to Algrek, Conall regarded him seriously. Taking a deep breath, letting it out, he spoke. "Algrek, don't expect things to be friendly between you and me. But... Don't expect hostility either. I'll treat you as a person should be treated." Conall gave a nod, then turned forward to the path the group had chosen to take. "Let us continue. I shall lead." Posted on 2010-06-25 at 02:34:26. Kenji paused and looked at the man a expression of disbelief upon his face. Had everyone been replaced by evil versions while he had been out of it? Was this then the result of having spent time trapped within the mirror? He couldn�t believe that Conall, the man he had fought beside so recently, was saying to trust an evil presence that had taken over Cor�s body. The Samurai opened his mouth to say something then thought it would only fall upon deaf ears; that everyone�s mind was already made up on the subject. He seemed to be the only dissenting voice and therefore would only be wasting further time in speaking his mind. As they proceeded, Kenji began to doubt his purpose here; his oath to see this through to the end.. The destruction of the evil sword. He swore to see the evil sword destroyed.. and he would carry out that mission with or without the help of the rest of the group if that is what it took. The Samurai silently vowed that he couldn�t trust anyone it seemed.. something had changed them and he would see the sword destroyed.. and he would kill any that got in his way. Posted on 2010-06-25 at 03:59:36. Alasdair utterly ignores Connall's attempt to lead them, having already headed through the door with Algrak beside him under the assumption that the issue of leadership had already been determined previously. I had assumed the position of leadership had already been decided. And by deed at that, not by word. I can only hope that they will follow my lead, and trust that there is a reason for the orders I give and the path I lead them down. Posted on 2010-06-25 at 13:12:41. Sir�ne followed the others in silence, she had already once voiced her belief that they should rest but to no avail. Alasdair was taking his new role of leadership far too seriously and the enchantress was beginning to think she liked him better before his memories returned. In the blink of an eye the man she once called Allanan had gone from one interested in the path of the Great Goddess to an overly pious follower of Odin - it did not please her. Even so it was who he truly was and Sir�ne could not deny the rightness of Alasdair's return to his true path even if it meant he turned away from the Lady. That and despite his new found piety she still felt a bond with him. It had been she who brought him back from the brink of death and she was not the habit of abandoning any she healed. Her gaze traced over the group until her azure eyes fell on the dwarf. That one would still have to be dealt with, it was only a matter of when. He had yet to fulfill his end of the bargain and she had little trust in him. For now she would watch and wait. As the group neared the door Sir�ne brought her attention to the matter at hand readying herself for whatever challenge lay beyond the doorway. Posted on 2010-06-26 at 22:53:36. Hi Ho Hi Ho off to the next Test we go. The party for good or bad had decided on a leader to replace Cor and a way to go, deciding to continue the tests instead of taking the new unknown passageway. With the apparent loss of Ulthok it was now Alasdair in the lead with Cor slightly behind him and the rest behind the now evil Knight Cleric. The hallway before the party the same as ever they moved slowly down its length with a left turn and then a second to the right and before them was another of the same wooden doors. However unlike the rest of the doors so far encountered this one was open. (DM OOC: Ok short post but not much to describe to you on what�s in the room. As for the description of what faces are where, I have sent the actual copy of the room�s floor to YeOlde and hopefully he will post it here soon. Until then above is the best picture assortment of letters I could arrange on the floor corresponding to creature name as listed below. Also the Party entered from the East and is facing a second wooden door to the WEST. Posted on 2010-06-28 at 03:05:25. Posted on 2010-06-28 at 21:58:18.
a room that flexes the mind? Posted on 2010-06-30 at 00:56:25. "That seems to me to be too simple a solution Maggot, though you are not wrong in your observations. My first thought was to step on the image of a zombie and see what happened. I suspect it would summon the creature depicted for us to battle. If this is the case we may be forced to battle our way across. I am also curious, if this is the case, does that particular section of stone become blank when the creature it depicts is destroyed?" Alasdair rubs the scruff on his chin thoughtfully, then closes his eyes for a moment to ask Odin the All Knowing for a clue. After a moment he begins looking around at the walls of the room (on this side of the grid) for any sort of clue or inscription. "Perhaps there is some sort of clue that might give us a glimpse to the solution. If nothing else, such a clue might allow us to confirm Maggot's suspicion." He turns then to Maggot himself. "If we find none, I will grant your request to be the first to test your theory, though I ask that you be cautious and do so slowly, lest these stones summon creatures or some other such enchantment we may not be completely prepared for." Posted on 2010-06-30 at 01:42:47. "If you are correct Alasdair that we summon a creature to battle with each step I would propose a path as follows; Start at the G to the South, then NW to the K, then NW to the G, then west to the K, then NW to the H, then west to the Z and finally west to the K. this would bring only low level creature who could cause us minimal harm. Of course someone has test the theory first. I do not suppose using the dead as a "test dummy" would correctly trigger the test or be acceptable to several of you so who shall it be?" Posted on 2010-06-30 at 02:59:34. Alasdair glares at Algrak for a moment after his latest comment. But when we speaks, he speaks calmly as the anger in his face slowly fades. "You are correct in assuming Rayne's body is unavailable to test the theory. The path you have chosen does seem to be a logical one however. Maggot? Since you have requested the honor of the first attempt, would you be willing to set foot on the ghoul image on the southern most block rather than the northern? We will be prepared for a ghoul to appear in either case, and if your belief is correct nothing will happen until the third step of the path, in which case we will be fighting a ghoul regardless. I would suggest that whatever we fight here, everyone take care not to step on the tiles. I would hate to accidentally summon an entire cabal of liches simply because one of us was careless with their feet. That is, of course, assuming my theory about the room is correct." Posted on 2010-06-30 at 04:33:14. "Maggot, prcan you explain your idea to me and the rest of us. I do think that working together to get this figured out woould be good. We have a lot of abilities in this group it would be best to utilizes and share all of our abilities to solved this test. I do not think this is as easy as you might think. We had problems with being easy in the room with the colored pegs. The answer seemed to obvious but it was not at all." "I have a feeling that stepping on a square with an undead that was already stepped on would be a bad idea." 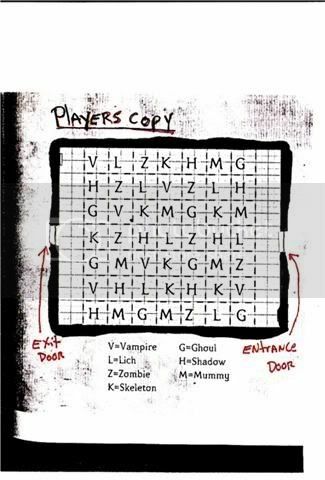 So notice there are seven different types of undead and the area is seven squares by seven squares. I do believe that a path must include all seven of the different types of undead and not repeat any of those already stepped on." Cynil finishes her observations. Posted on 2010-06-30 at 05:55:27.